Holding true to the standard of apeSoft, apeMatrix continues to push the limits of possibilities in music creation. Automating almost every aspect of linked control, apeMatrix brings all your creation tools together and links them both in MIDI and audio. Letting you inject all your favorite FX both AU and IAA in a very easy and intuitive way. 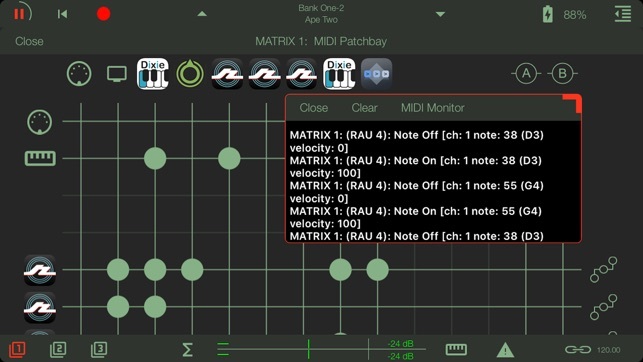 apeMatrix can also assign its Control Manager MIDI, Accelerometer, Scrub and LFO’s to modulate every built-in parameter and any parameter available inside the AUv3 (Audio Unit Plugins). apeMatrix offers 10 slots on each of the three Matrix grids with 2 bus slots on each grid that make it possible to interconnect all 3 Matrix. The MIDI Patchbay also offers endless possibilities for MIDI routing and control in a similar grid design for both internal and external MIDI control. 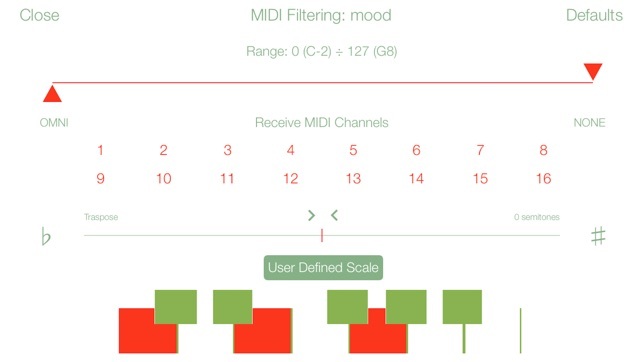 So you can send and receive MIDI and have ultimate control over where its routed. 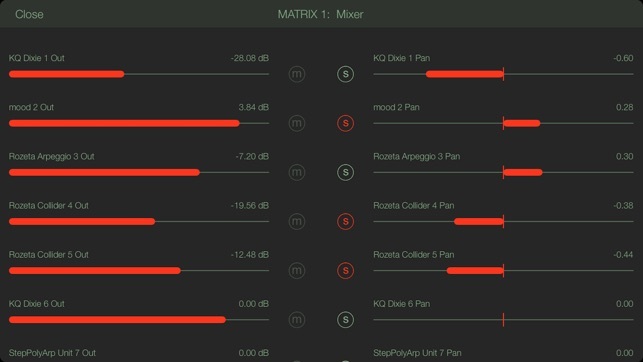 Each Audio Connection on the grid has its own gain control. 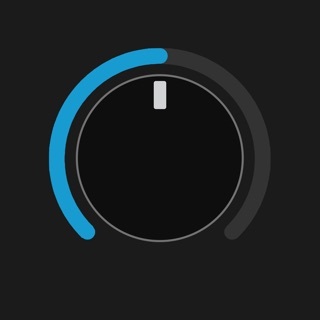 Just tap on the node and drag will give you the full range of volume control. 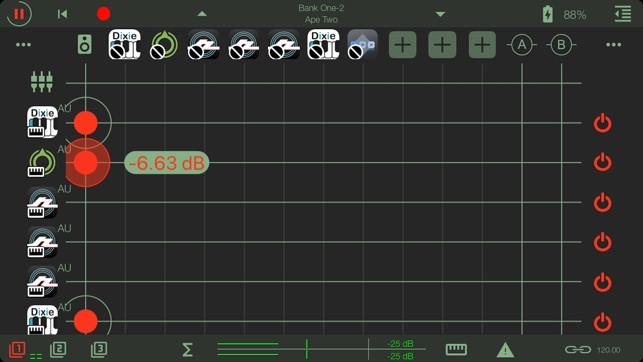 Or use Mixer to controls the RAU output and automate them using apeSoft’s unique Control Manager MIDI, Accelerometer, Scrub and LFO’s to modulate every built-in parameter and any parameter available inside the AUv3 (Audio Unit Plugins). Turn each slot on or off by a control switch on the Matrix or MIDI control. Control output, pan, mute and solo of each slot and Master output of each Matrix with the built in mixer control or MIDI control. Route your sounds through all a series of FX or route multiple sounds through the very some FX. The possibilities are as endless as your creativity. 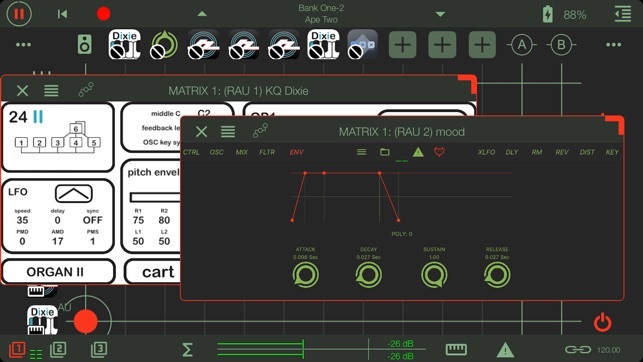 if you like using multiple fx, if you want to play w routing midi to multiple different (or same) AU, playing granular synths and drum sequences thru different, separate fx chains but then routing both thru the same wild Auto-Wah effect... Get this App! I never, ever thought that there could come along an AUM killer. Enter apeMatrix. It's just as elegant, pretty, and even more efficient than AUM at setup with both its matrix and its alphabetized, sortable-by-type app menus (anyone who has a ton of music apps knows how much scrolling AUM can take to set up). I've only opened AUM once since I bought apeMatrix opening day, and only then for its file player. Latest ape update with the metronome was much needed. I'm 99% satisfied. Really the only key feature missing now is separate outs for recording, but since I just use it for jamming live and sketching out ideas to take into Auria or Cubasis, I don't really need it. 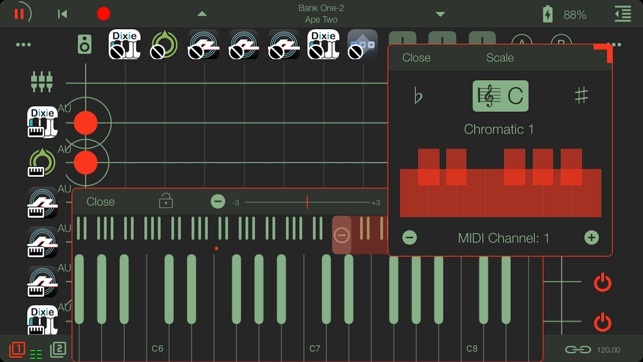 Gives you a variety of powerful options and quick and easy ways to route various kinds of devices whether it be midi or audio. Gets 5 stars already for what it is. Would be nice if there was a way to ‘midi map’ opening a device. Either to show an audio unit (same action as tapping the icon of the app), or switching to IAA devices at the tap of a key or button would be nice. It gets difficult having to rely on the screen to switch between apps. Bonus points if it could do this even while running in the background.